Consider Volunteering for the French Food Festival – your help is needed this year! The link below will take you to the volunteer hub. Everyone will need to register even if someone has sign up in previous years because it is a new website. We did it!!! Thank you for your enthusiastic support of the National Protest Against Planned Parenthood last Saturday. We stood together with thousands at over 228 Planned Parenthood locations to expose the underbelly of the abortion industry and demand our tax dollars NOT be used to terminate unborn babies. The media coverage of our event was spectacular, garnering attention in local and national press…below are links to all the stories, articles and pictures. Enjoy! Thanks again for making #ProtestPP such an outstanding success. I look forward to working together again with you soon. WTVR-TV6 (CBS) Voice over story using 2 photos from the event. Text below. HUNDREDS OF PRO-LIFE ADVOCATES HOSTED RALLIES AT MORE THAN TWO HUNDRED “PLANNED PARENTHOOD CLINICS” ACROSS THE COUNTRY… INCLUDING HERE IN RICHMOND. HERE YOU SEE THE LOCAL DEMONSTRATION— IN FRONT OF THE RICHMOND MEDICAL CENTER FOR WOMEN. THESE PROTESTS ARE IN RESPONSE TO VIDEOS THAT PURPORTEDLY SHOW ABORTION PRACTITIONERS ARRANGING TO SELL REMAINS OF ABORTED BABIES. THESE ACTIVISTS SAY THEY HOPE TO BRING AWARENESS TO WHAT THEY CALL “POOR PRACTICE” AT THESE CLINICS. Save the date to advanced degrees! Save the date to advance on Thursday evening May 26th, 2016. The 2nd degree continues the Knighthood journey and builds understanding and awareness, helps explain why we work together to help each other and make good things happen. Our Council 5476 1st Degree Brothers are encouraged to take the lesson of Unity and advance to the 2nd degree of our Fraternal Order on Thursday May 26 at the Church of the Vietnamese Martyr’s. The church is located at 12500 Patterson Avenue in Richmond Virginia. The church sits back off Patterson Avenue on the right side after the West Creek Parkway. 2nd degree candidates should arrive with Current Membership Card no later than 8:00 pm. The 2nd degree will start at 8:30 pm. Proper attire is coat and tie. Be aware that this advancement event includes a 1st Degree Exemplification which starts at 7:00PM and concludes at 8:00PM. Please join Chancellor Ron Coombs & I on your spiritual journey to service and Knighthood! Please let us know of your intentions. Congratulations to Rick Witty who was exemplified to the Fourth Degree of the Order in Roanoke on April 9, 2016. Rick advanced with 71 other 3rd Degree Virginia Knights of Columbus into Full Knighthood. The Fourth degree represents the Patriot degree which strengthens their fraternal causes dedicated to our love of Country, love of Church and love of Family. Please extend your congratulations to this most worthy St. Bridget’s Knight Rick Witty. It is difficult to fathom the loss of one’s child. 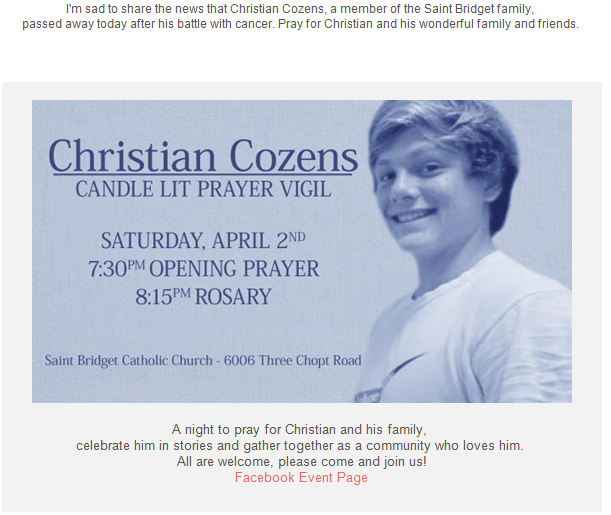 Please keep Brother Cozens’ family in your prayers. Attend the Saturday vigil if you are able.